We will delight in this luxurious guestroom as well take advantage of our king size Hilton Serenity bed while admiring stunning coastline views of the Atlantic Ocean. We can’t wait to wake up to the Hilton alarm clock with MP3 and enjoy the freshly brewed coffee from our convenient coffeemaker. If we need to work, we will connect with WiFi access. After a long day, we will soak in a relaxing bath. We will take comfort in this King Bed Pool View room with king size Hilton Serenity bed while admiring the view of the beautiful sparkling pool, whirlpools and majestic ocean. We will stop by the Atlantic Deli for a quick bite to eat or pass through the Atlantic Gourmet Coffee & Marketplace for a warm cup of Gourmet coffee, fresh pastries, and scrumptious deli items. 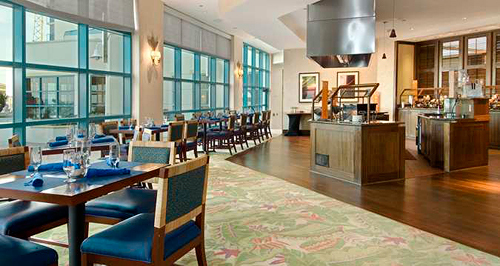 It is Hilton Daytona Beach Oceanfront Resort’s mission to provide the ultimate dining experience to their guests. The onsite chefs select the freshest products and finest ingredients to provide us with extraordinary and memorable dining experiences. 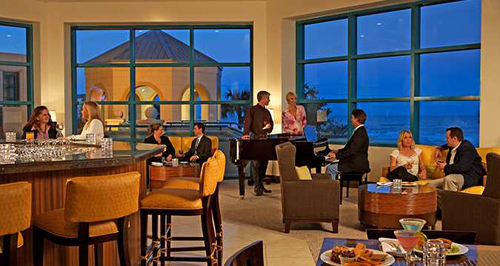 We will relax in the intimate lobby piano bar and restaurant, overlooking Daytona Beach and the historic Clocktower. We will be sure to take advantage of the extensive bar, offering upscale appetizers. At Doc Bales’ Grill, we can enjoy ocean front dining or outdoor dining on the inviting outdoor terrace. 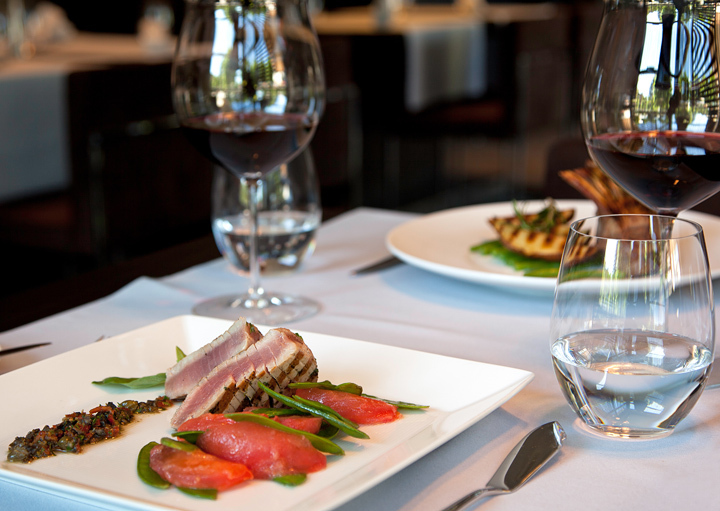 Doc Bales’ Grill offers tantalizing seafood specialties in a casually elegant atmosphere. For an intimate meal inside the privacy of our own room, we will enjoy breakfast, lunch or dinner with just the two of us. We may even indulge in some dessert to make our dining experience even more enjoyable. 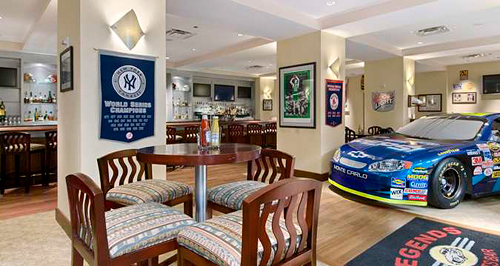 At this racing themed bar and restaurant, we will admire plenty of racing and sports memorabilia surrounding us. 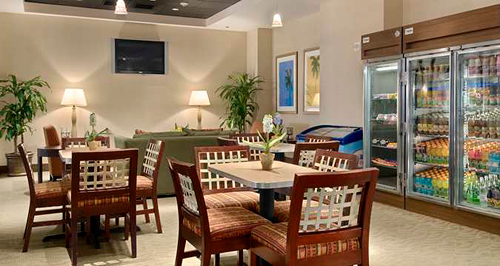 We will savor delicious food and libations in a fun and friendly atmosphere, all while watching our favorite sporting events on one of the plasma TVs. This outdoor pool bar and grill will give us the perfect opportunity to be amazed by our surroundings. Overlooking the Atlantic Ocean, The Pelican Bar features grilled specialties, an expansive deck and live music on the weekends. 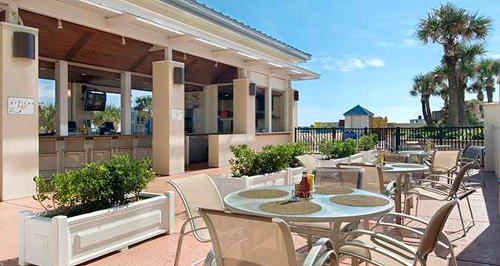 We will enjoy this seasonal beachfront bar just steps away from Daytona Beach to enhance our romantic getaway. 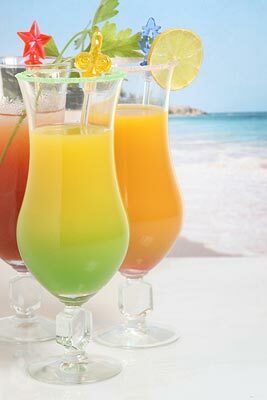 We are very eager to experience drinks in a truly unforgettable way. Thanks to your wonderful wedding gift, we will experience extra indulgence on our romantic honeymoon at the Hilton Daytona Beach Ocean Walk Village! We can indulge in oceanfront dining at Doc Bales' Grill, the hotel’s signature restaurant, or enjoy a casual meal at the beachfront Poolside Pelican Bar. Whether we wish to stay active or simply relax, we will enjoy endless recreational facilities at this Daytona Beach hotel. It will be our pleasure to rejuvenate at the fitness center, pools and whirlpools or sample the latest treatments at the hotel spa. 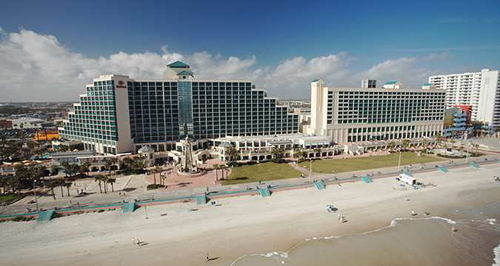 Located in the heart of the Ocean Walk Village on the ‘World’s Most Famous Beach,' we will enjoy the Hilton Daytona Beach hotel which offers stunning views of the Atlantic Ocean and easy access to the thriving seaside, entertainment and meetings district in Daytona Beach. 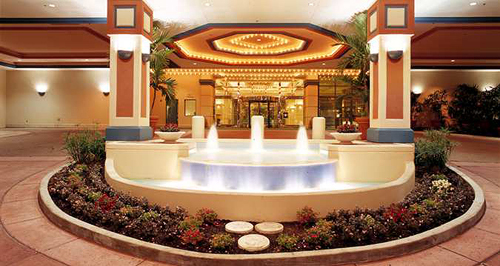 Whether we are planning a special occasion or simply need to unwind after a hectic work week, we will make the most of our weekend and book a Bed & Breakfast package at the Hilton Daytona Beach Walk Village.